where the Musofalo and the Fiumarella converge. Overlooking the Gulf of Squillace, in the Ionian Sea, is where, according to some scholars, was the port of the kingdom of the Phaeacians, where, as told by Homer in the Odyssey, Ulysses was welcomed and told his story. It was once known as the city of the "3 V's", as a reference to the three distinct features of the city, namely San Vitaliano, the patron saint; Velvet, as an important silk center since the time of the Byzantines; and Wind (vento in Italian) as constantly experienced by the strong breezes from the Ionian Sea and Silas. It was Italy's first city to to introduce the breeding of the silkworm in the 11th century. A large part of the population was involved in this business, and the silk of Catanzaro supplied almost all of Europe. The silk was sold in a large market fair in the port of Reggio Calabria, to Spanish, Venetians, Genovese and Dutch merchants "VVV" was the symbol by which Catanzaro's silk industry was known by, identified for both its domestic and foreign markets, and iconic for the finest fabrication of silks, velvets, damasks and brocades from the city. Granted to the counts of Ruffo by Frederick II, in the Renaissance it became a royal city and entered a period of great flourishing, which was interrupted by the arrival of the Spanish. bons, it participated in the Risorgimento and was one of the leading Carbonari centers in the Kingdom of Naples. 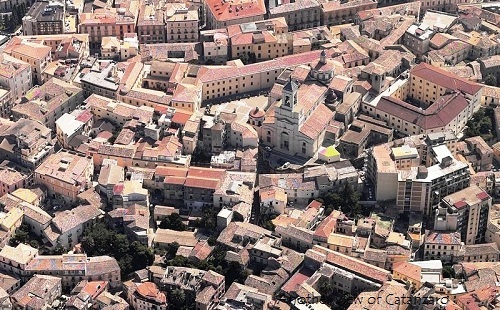 Having suffered earthquake damage numerous times, few of Catanzaro's ancient monuments remain. Still, the medieval structure of a few quarters is almost completely intact, with narrow, circular streets. 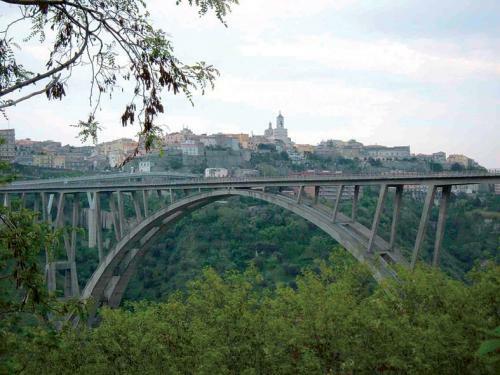 The magnificent single span bridge over the Fiumarella was built by the architect Morandi. At 400 meters long and 100 high, it exemplifies the city's strong desire for expansion and modernization. Embellished by the imposing Justice building, Piazza Matteotti marks a sort of boundary between the modern northern districts and the older ones to the south. From here, following the central Via Mazzini, we come to nearby Piazza Garibaldi and the unconsecrated church of S. Omobono, the oldest monument in Catanzaro (13th century). Proceeding beyond Piazza Rossi, the lovely 9th century public gardens of Villa Trieste are the site of the interesting provincial museum, full of ancient finds and works of art. Farther west, near the cathedral, the 16th century Rosario (or S. Domenico) church. Catanzaro, overlooking the Gulf of Squillace, in the Ionian Sea, is where, according to some scholars, was the port of the kingdom of the Phaeacians, where, as told by Homer in the Odyssey, Ulysses was welcomed and told his story. Calabria's capital: The main city of the province and region, located on the Ionian side of hills just south of the Sila, not far from and in sight of the Gulf of Squillace. It is also also known as city of the three V's, referring to the three distinct features of the city, namely San Vitaliano, the patron saint; velvet, as an important silk center since the time of the Byzantines; and wind (vento in Italian) as constantly experienced by the strong breezes from the Ionian Sea and Silas. 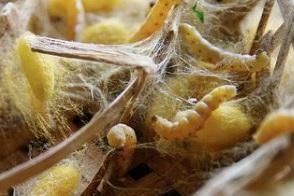 It was the first place in Italy to introduce the breeding of the silkworm in the 11th century. During the summer months, the Ionian coast from Catanzaro to Soverato is an important tourist attraction, especially for the youth, and is in the presence of several important structures located in the coastal districts of the city and the town of Copanello Soverato. 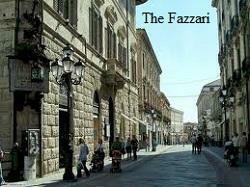 Catanzaro is known as the "city of two seas", and the city of the three hills. it is located in the isthmus of Catanzaro, that is, the narrower strip of land of Italy (30 km), between the Ionian and Tyrrhenian Sea. It lies huddled together, with an irregular street system, on a rocky spur limited by the deep valleys of the Musofallo and Fiumarella rivers. Above & Below the one arch bridge Morandi-Bisantis . The valley slopes are steep and wild, except to the south-east, where the terraced flanks falls towards the plain. 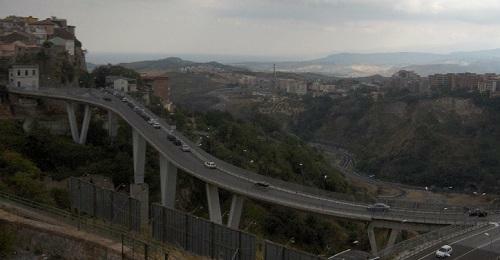 North-west , a neck of land (with Matteotti Square) links the spur to the south Sila foothills where the modern urban area stands. Begun in 1909 with the construction of the Milano area, later flanked by the San Leonardo, the city was seriously damaged by earthquakes in 1638 and 1783. From 1870 onward, it was radically transformed with a new lay out. 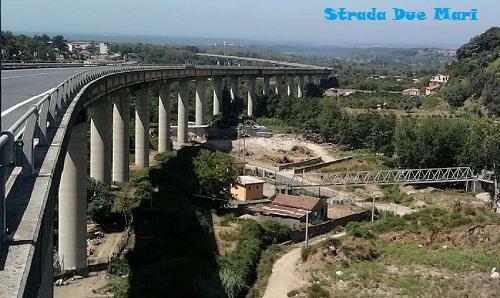 Expansion toward the west and south-west started with the construction of the Due Mari (Two Seas) highway and the high viaduct of the Fiumarella. The morphological characteristics of the ground have conserved most of the original medieval village, though reconstruction, earthquakes and large-scale building undertaken in the late 18th century have practically destroyed all traces of ancient monuments dating from the earliest days to the Baroque period. 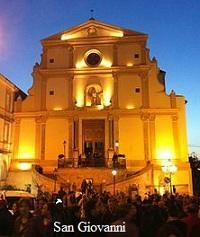 One exception: the Church of San Omobono, in Vicolo del Telegrafo, behind Corso Mazzini. Deconsecrated and neglected, it was built in the 13th century for the tailors' confraternity, and is still well conserved, with a modest facade with doorway and two simple windows. Little remain of the medieval castle, built in about 1060 by Roberto il Guiscardo and demolished last century, except for a few structural traces, to make way for the large prison. The maze of lanes in the medieval quarters, narrow twisting wynds, the frequent flights of steps and stairs linking the various levels of the agglomeration of houses all stand as transformed in various periods, especially in the 17th and 18th centuries, by spontaneous construction, as seen in the rustic buildings and picturesque areas with loggias, flights of steps, large houses and simple cottages with little Baroque doors. Restoration of the main city churches also dates to the Baroque period (Rosario or San Domenico, San Giovanni, Immacolata and the Cathedral); the church of Monte dei Morti , with a bare facade and twin flights of steps, with florid 18th century doorways, niche and window above, is the most interesting example of that time. The first has two sculptures: the Madonna della Purita' by Cassano (1613) and a 15th century. Redemer; the second, a marble statue of San Rocco, sculptured in the 16th century by d'Auria , a pupil of Giovanni da Nola; the third church has a Baroque-style carved chair (18th century). An interesting example of the taste of the time (19th century) is Palazzo Fazzari (now Larussa) built in 1874 in imitation of 15th century Florentine forms. 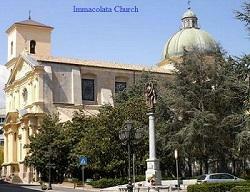 In via Pugliese stands the church of the Osservanza built in the 15th century. Inside there is a marble Madonna by A. Cagini (1508) and a 17th century sculptured group by Fra' Giovanni da Reggio. 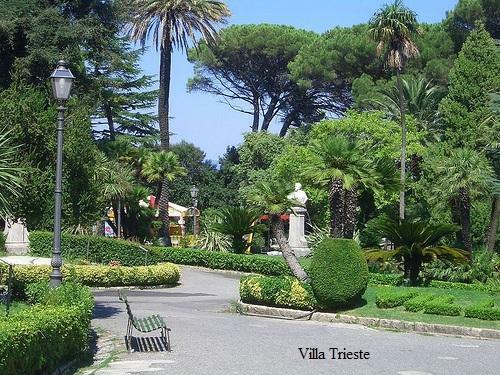 Point of interests: Public gardens of Villa Trieste. Provincial museum with a collection of antiquities, ceramics and coins. Events: Traditional Good Friday processions. The basic ingredients of Catanzaro’s cuisine are simple and genuine, like olive oil, hot pepper and wholemeal bread. The local specialities are the pasta chjna, a pasta filled with provola cheese, boiled eggs, soppressata and dressed with meat sauce and grated cheese; and the ciambrotta, a vegetarian dish made with pasta and a dressing of fried eggs and pecorino cheese. The most famous dish among the second courses is u murzeddhu, a special tripe cooked in a spicy sauce and served in a typical local round shaped focaccia bread (pitta). The stigghiole – entrails of kid, veal or pork cooked with tomatoes, vegetables and chilly peppers – are also to be mentioned, as well as sausages like the soppressata and cheeses like the butirri, a caciocavallo with butter inside. Typical pastries are the crocette: dry figs filled with nuts, cinnamon and candied cedar cooked in the oven. The pastries are served with the local Malvasia wine. Among the table wines we recommend those produced on the hills of the province. Speciality dishes: U morzeddhu. A dish based ...on veal inna rds. Although there are simplified versions (eg morzeddhu done with only tripe), the original recipe requires veal heart, lungs, spleen, liver, tripe, (and other stuff'), cut in small pieces and cooked using tomato sauce, hot peppers, salt, oregano, and bay leaves. The origins lie in the area between Catanzaro, Tiriolo and Tavern and can can be traced back to an ancient recipe of Jewish origin, or perhaps Saracen. It is now also in available in jars at many local stores in the area.